When producing partners Kristin Hahn and Jennifer Aniston first formed their company, Echo Films, they had one mission, according to Hahn: to become "a passion project company." In the past few years, Aniston and Hahn, through Echo, have overseen the making of Cake, the movie that earned Aniston a Golden Globe nomination, and now they are working on their next film, The Yellow Birds, currently in post-production. Yet even with some serious success behind them, not to mention Aniston's own popular work and Hahn's time as a producer on The Departed and on the upcoming big screen adaptation of Stargirl, they had to wait quite sometime for someone to pick up their ultimate passion project: a movie about the Goree Girls they have been shopping around for years. In this case, it seems, star power and past success isn't enough to get a movie off the ground — as Kristin Hahn tells Bustle, it takes an infinite amount of determination instead. "It takes an undaunted kind of courage, frankly," Hahn says, particularly when the movie is a female-driven story like her newest film, Tumbledown , in theaters now. The film, which Hahn produced with her solo company, Hahnscape, tells the story of Hannah (Rebecca Hall), a woman who, while grieving the loss of her musical genius husband and trying to write his biography, becomes intertwined with Andrew (Jason Sudeikis), a clever American Studies professor enamored with her husband's work. The film is a perfect example of the kind of project Hahn wants to support, one that tells a relatable human story and happens to feature a strong female character. Says the producer, "We all share in the same emotional canvas in different ways, different shades... We're ultimately not alone, and I think movies are a beautiful way to experience the not being alone-ness of being human." Which brings her to the Goree Girls. The musical group, also known as the Goree All Girl String Band, were one of the first all-female bands in the United States to ever hit it big. Formed in prison in the 1930s, the Goree Girls, according to Texas Monthly , was made up of eight female prisoners, who, after making their radio debut in 1940, booked regular radio gigs and quickly became stars. It sounds like a pretty great story for a movie. but although Hahn and Aniston have tried to get it made for years, the Goree Girls haven't yet managed to hit the big screen. Hahn sums up the reasons why: "because it's a period piece, because it's set in prison, because it's women." It's difficult to imagine that a similar film with men as the main protagonists would face the same challenges Goree Girls (as it's tentatively titled) has had just making it to production. In 2009, the film suffered one of many false starts, when Michael Sucsy signed on to direct and a production date was set for January of 2010. Yet that soon fell apart, and plans for the movie now are totally different. 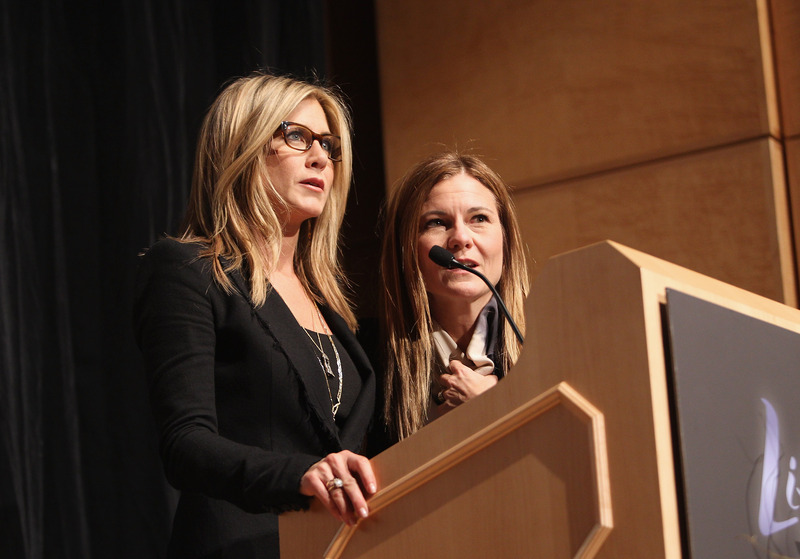 Yet despite these setbacks, Hahn says that she and Aniston never abandoned the project, instead constantly reminding each other of their passion for getting the movie eventually made. Says Hahn, "We talk about it. We keep it alive. And, now, we're trying to cast it and we have our director and... we're going to make it." It certainly looks like Goree Girls might finally be on its way onto the big screen. As Hahn teases, a female director has signed on to helm the project, though the details has yet to be released. But with this major step accomplished, Hahn expresses nothing but the utmost confidence that her movie will eventually have its day in theaters. "It's taken many years and we've been rejected many times, in many different ways. And we — we don't care," she says. "The rejection means nothing to us. Telling the story means everything to us." Essentially, Goree Girls is the epitome of Hahn's and Aniston's mission as producers: a passion project in every sense of the words. Another story Hahn is desperate to bring to the big screen: Jerry Spinelli's YA novel Stargirl. Hahn is producing Stargirl with Hahnscape as well as writing the screenplay, and as she tells Bustle, she couldn't be more excited about finally bringing the beloved 2000 novel to the screen. Says the producer, "The world needs Stargirl." Rising star Joey King (Fargo, Ramona) will play Stargirl in the adaptation, and Catherine Hardwicke is set to direct what will surely be a feminist movie full of girl-power themes that'll resonate with young fans. Says Hahn, "I want that character for my daughter. I want Stargirl out there as a character girls can relate to, and that can make being kind, cool and being an individual OK."
And if it takes a bit more time before actually reaching the screen? Hahn will be prepared; as she tells Bustle, "You can't give up, and you can't take it personally when people say, 'Nah, don't love it, don't want to do it.'" "Eventually," the producer says, "You will prevail." And as her resume shows, she couldn't be more right.